Your body language reveals a lot about how you’re really feeling and the same is also true for your pet bird. A single wing flap, feather ruffle or beak grind can help you to understand what’s going on inside their heads. Learning these signals will enhance the training, care and bonding that you can achieve. So read on to discover the subtle meanings behind every body movement and gesture of your birds. In this section, we’ve separated each major body part into its own category. Each body part can be used in multiple ways, with each use signaling a different meaning. Alternatively, check out our later section which lists parrot body language based on emotion. Parrots may click at you as a sign of greeting when you enter the room and because they’re content and enjoying what you’re doing. However, keep an eye on other parts of the body as on rare occasions it can be a warning sound used to keep someone away. A common sound of a relaxed parrot that is happy and content. Grinding may also occur when the parrot is sleeping. Parrots may also grind their beaks in order to prevent them from becoming overgrown. Simply done to clean the parrot’s beak after it has eaten some food. Not to be confused with preening. May occur when two parrots are playing. Doesn’t involve regurgitation and is a form of bonding. Can be done for the obvious reason of eating food but also is used aggressively to defend or attack another parrot or person. 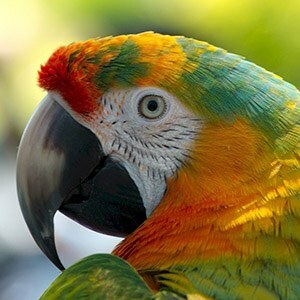 If you’re having problems with parrot biting then check out our article here. 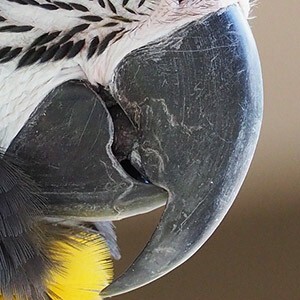 Watch out for this one because if your parrot has it’s neck extended forward and it’s mouth open then this is a good sign that it’s intending to bite you or something. This is when a bird will push up the food from its stomach and out into the mouth of another bird. It’s used by adult birds to feed their young and also used between mating pairs of birds as a way of feeding and bonding with one another. Be cautious if your parrot is regurgitating on you as the parrot may be considering as a mate and could cause parrot over bonding issues. Usually a sign that the bird is happy, content and wanting attention. This happens when your parrot decreases the size of its pupils very quickly. Essentially it means that the bird is in a heightened state of emotion, which could be either positive or negative. For example, eye pinning may occur because the parrot is excited or curious about something, but it can also happen when it’s feeling aggressive, threatened or doing a territorial display. 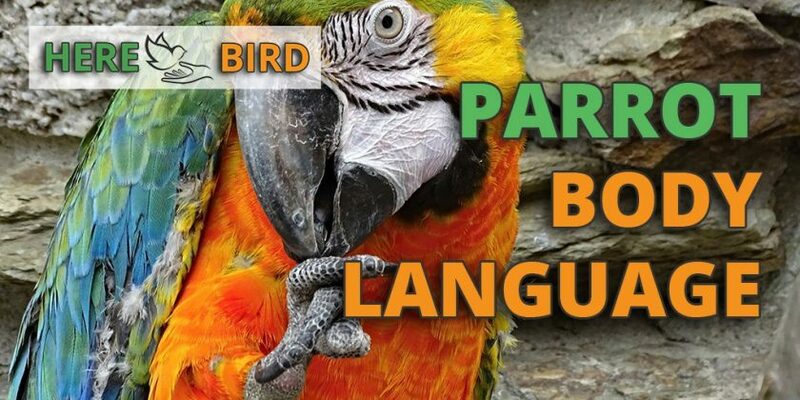 Look at our section here on parrot body language by emotion to understand more. On the other hand, pupil dilation tends to occur when they are relaxed. Whilst petting your bird this can indicate that they are very content and they want you to continue. It can also be a sign that your bird is tired and about to fall asleep. An obvious sign that the bird is sleeping. Birds will ruffle their feathers whilst they are preening themselves (see below). 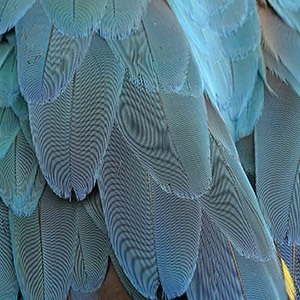 Feather ruffling will also occur after a parrot has become wet and wants to dry itself, or when it has become unclean and wants to get rid of dirt. It can also just be done as a form of resting/relaxation. Powder or dander may appear after a feather ruffle in some species of bird and this can cause allergies for some people (see our full article on controlling bird dander). Just above the tail is the location of the preen gland. Birds will rub their beaks into this gland for the oil it produces and then rub this oil on the rest of their feathers to clean themselves. This is an activity which occurs when the parrot is relaxed. See our full article dedicated to feather preening here. Not to be confused with feather plucking. This is when the feathers at the head of your parrot are raised. It frequently occurs in cockatoos or cockatiels and has it’s own meaning with these species of birds (see below). It can also occur with other species of parrot when they are content, relaxed and being scratched or petted. However, if the parrot is in an aggressive stance then they may raise their feathers so they can appear larger and more threatening. A body movement that you need to look at in combination with other body movements to understand it’s emotion. This can indicate that the bird is scared, untrusting and afraid of the current situation. However, it can also be a sign that a bird is simply preening itself, or it can also indicate an illness. If the temperature is cold then shaking feathers could indicate that the parrot wants to be warmer. Quaker parrots are frequent shakers and for these birds it has a different meaning (see below). 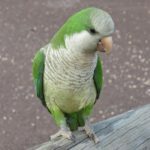 Why do parrots bob their heads up and down? This is a common movement that you will see in chicks when they are trying to get their adults attention so they can be fed. As an adult parrot then can also be a sign of begging for food from you as well. However, it can also be a sign of the bird is excited or that they want attention. It can also be used as a movement in mating rituals for some species. 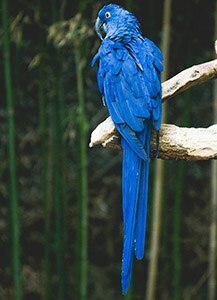 A unique body language sign that is usually on display in Macaws (see below). If your parrot is dropping its head towards you then this is normally a sign that it wants attention and to be petted. However, if it is crouched on a perch and its wings are lowered then this can be a sign that the bird is about to fly off. When a parrot is crouched down on its perch and its wings are extended then watch out, it’s a sign they’re about to take off! However, if their head is stuck out low but they don’t look like they’re braced for flight then this may mean that they simply want some attention and petting. Why do parrots dance? Parrots are commonly found dancing away to music, so put on some good tunes! Research indicates that if music speeds up or slows down then the parrots will adjust their dance accordingly, showing that these birds know how to keep a beat. A natural sign of happiness and excitement. This is the posture used by many species of bird when they are sleeping. One leg will hold a firm grip onto a perch whilst the other leg will be tucked into the body and the head will be tucked into their back feathers. Perching on two legs is normal if the bird is awake and going about it’s day to day business. However, if a bird is sleeping whilst perched on two legs (and it normally does so with one leg) then this could potentially be a sign of illness or injury. Birds will typically scratch themselves with their feet or beaks during preening or when the parrot is relaxed and grooming itself. However, it could indicate a problem or irritation on part of the parrot’s body if it is occurring frequently in one location. You might find your bird tapping its foot to signal its territory and dominance over an area – so watch out! However, foot tapping used by Black palm cockatoos has a species-specific reason (see below). You’ll find this happening after a bird has just done some exercise and is catching its breath because the bobbing motion helps the bird to respire. If you notice tail bobbing happening a lot in a bird that hasn’t been exercising, then this could indicate breathing problems and you should check for illness in the animal. This is where your bird will be spreading its tail feather out sideways so that the bird appears larger in size. It’s an aggressive display that you need to be careful of. Frequently this will occur just before your parrot is about to poo. It’s useful to keep note of this if you are trying to potty train your pet bird. This is the quick movement of a parrots tail feathers from one side to the other and is similar to how dogs wag their tails. Parrot tail wagging indicates that the bird is content and may also happen after you meet a bird, a sign of greeting from the bird to you. Tail wagging sometimes is used as part of a mating ritual. 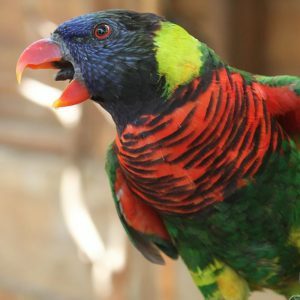 Parrots communicate through a range of vocalizations and can produce an incredible number of diverse sounds, including mimicking human speech in some cases. Large parrots have voices that can carry for miles so they can call to their flock in the wild. 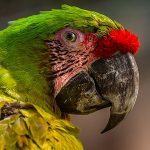 There are far too many sounds to list within this article, instead see our full article dedicated to parrot sounds and noises. 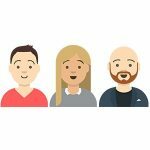 Additionally, if you’re having problems with parrot screaming then check out our guide to preventing this here. Can have multiple meanings depending upon the context. Young birds will droop their wings before learning how to tuck them in properly. A bird may droop it’s wing because it is tired or maybe even drying itself off because the wing is wet. Sometimes a wing drooping might indicate an injury and it even can be used as part of a mating display. Check what else is occurring whilst the wing drooping is happening to fully understand the bird. Wing flapping is obviously used whilst flying, but when birds are perched or on the ground then they may be flapping their wings to display aggression and show off their physical prowess. Alternatively, a quick wing flap can be used as a form of quick exercise, the same as stretching or to simply to help itself balance on the perch. 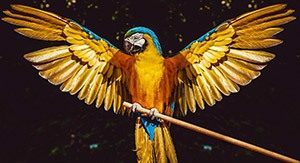 Just as a human will stretch out their arms when they are relaxed, a parrot will stretch out their wings to help extend their muscles. However, wing extending can be done by a parrot to increase it’s size and is a display of aggression. Parrots display their emotions by using a combination of body parts all at once. This section will show you how to read these combinations and understand the emotion that your bird is feeling. When a parrot is becoming aggressive it will make itself as large and noisy as it possibly can to intimidate its opponent. So aggressive displays include puffing up their feathers, stretching out their wings and also flapping. They may flare their tail feathers and the parrot’s eyes may pin due to it’s heightened emotional state. Additional sounds such as screaming, screeching and hissing may get made by the bird. Happens when your bird is staring at you and has come forward toward to the edge of its cage or perch. The bird may lower its head or body and stretch out its neck if it wants to be scratched. Head bobbing is another way in which a parrot may try to grab your attention. If the parrot is raising one foot up towards you then it may be a sign that it wants to be picked up. Your bird will have its head stuck up and maybe even tilted to the side so that it can get a better view of something. The neck might be stretched upwards or outwards as well. The head feathers may be up and the back of the bird could be straight with its eyes pinning. Parrots can be very playful in a variety of ways and it is one of the best things about them. They might be lying on the floor upside down or even hanging upside down on their perch. Interacting with their parrot toys is an obvious sign of play as is climbing up and down the cage wires. Bobbing of their heads, hopping and dancing are further signs. Signs may include your bird trying to move away from you or something that it is scared of, plus they may try to hide in the corner of the cage or underneath an object. Another indicator is if your bird is shaking in fear or hissing at you. Aggression displays may occur whilst the bird is afraid. Rapid wing flapping also indicates that the bird may want to fly away but perhaps they cannot (for example if they are caged). Birds will take on a specific posture just before they fly off. They’ll crouch slightly on their perch, their head will be down, their wings will be braced from their body, and they’ll be leaning forward slightly ready for the flight. Your parrot can display its happiness in numerous ways. They will engage in playful activities such as head bobbing, swaying and tongue wiggling. They might also lower their heads for petting and fluff their feathers or wag their tails. Vocally, your bird may begin to sing, talk to whistle. If a bird mounts you or another bird and rubs its crotch then this could be a sign that it is trying to mate with you. A bird may also regurgitate its food on your which is another sign that the bird thinks of you as a mate because this is what pairs do for one another in the wild. However, these behaviors should be discouraged because they can be a sign of parrot over bonding. A slight crouch and the raising of the tail feathers are a sign that your bird is about to poo. Look out for this activity if you are trying to potty train your pet bird. There are numerous signs that a parrot is relaxed. These include beak grinding and clicking, tail wagging and the slight fluffing of the feathers on their necks and back. They will also engage in the preening of their feathers and the stretching of their wings. Because many birds can be preyed upon in the wild, they will try to hide their illnesses and injuries so they do not become an easy target. 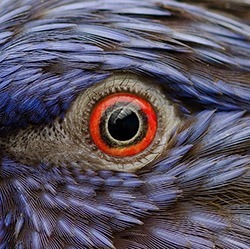 This makes sickness and injury hard to detect in a bird. But if the following signs are being displayed and there are no good reasons for them, this could indicate an illness: heavy breathing/panting with tail bobbing, wing drooping, perching on two legs (instead of the normal one leg). 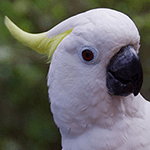 See our articles on parrot diseases and also bird injuries. The normal signs that a bird is sleeping are for its eyes to be closed or almost closed, one foot perched and holding its body weight whilst the other foot is tucked into its body feathers. Occasionally you’ll get some birds that will be perfectly happy to lie on their backs whilst sleeping. Similar to aggression, territorial displays are used as a warning sign to keep others away. Things to watch out for include the bird making themselves look bigger by stretching their wings and sticking out their feathers, their eyes may pin and they may also tap their feet. Below is a video that demonstrates some of the parrot body language described above. 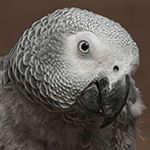 Compared with other parrot species, your African Grey might shake it’s head more frequently and so this should not be a cause for concern. Find out more about African Greys here. A Black Palm Cockatoo is more likely to tap it’s feet because this is how it drums wood to detect food in the wild. So in this case, the foot tapping it does may not indicate territorial aggression as it would do in other species of bird. Find out more about Black Palm Cockatoos here. A cockatoo or cockatiel can raise it’s head crest feathers and does so when it has an increased emotional state such as excitement, curiosity or fear. Some species will also be able to fluff their cheek feathers and this is a sign of contentment. Find out more about Cockatoos here. A very unique trait amongst macaws is for them to blush their faces. 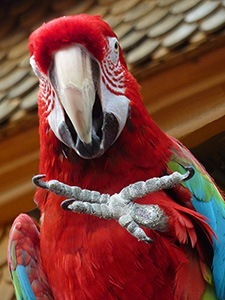 Other parrots may also do this, but it is only noticeable in macaws since their face is not fully covered by feathers. Blushing occurs during heightened emotional states and is usually within a social context between parrots or between a parrot and its owner. To find out the science behind behavior you should check out this journal article here. Otherwise, you can find out more about Macaws here. These birds will often shake, quake or shiver as part of their everyday body language, much more so than any other species of bird. This is completely normal and is not a cause for concern. Find out more about Quaker Parrots here. Take better care for your bird as you can understand its needs. Train them faster and teach them more tricks. Prevent biting and reduce aggression. Understand why they are screaming and teach them how to stop it. Identify if they are sick or injured. Form a stronger and better bond with your bird. 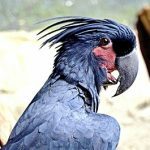 As with many aspects of parrot care, there is a lot going on with these complex creatures. If you take the time to learn these non-verbal communications you’ll make life better for both your bird and your human family.